In discussing the theme of biblical miracles, several important areas of consideration must be surveyed. 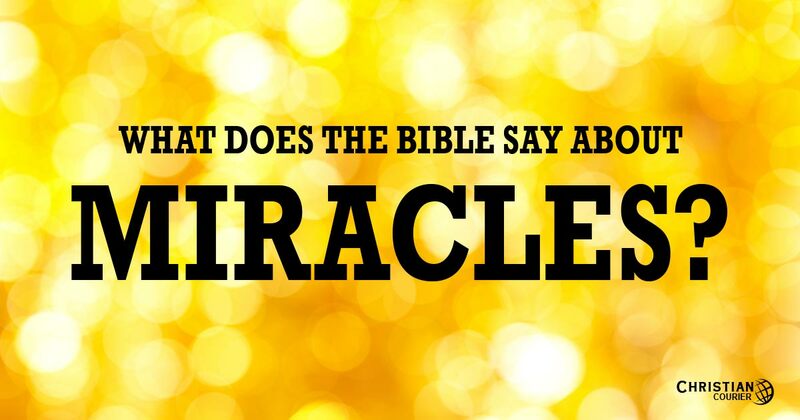 First, exactly what is a miracle? People use that term rather loosely—frequently, not at all in a scriptural sense. And what are those tell-tale traits that identify the miracle and distinguish it from a natural phenomenon? If folks only knew what to look for in certifying the miraculous, they surely would be aware that supernatural deeds are not being performed in this age. Second, what was the design of those “wonders” which are described so dramatically in the Bible? And how did those demonstrating these “signs” come to possess them? Further, does the Bible itself contain any information as to whether miraculous displays would be perpetual, i.e., until the end of time, or whether they were to be confined to a relatively brief span of history? Finally, if genuine miracles are not a part of today’s world, just how does one explain the feats which are flaunted by so-called modern “faith-healers”? These are questions which we propose to answer in this study. How does one define a miracle? A miracle is an event which the forces of nature—including the natural powers of man—cannot of themselves produce, and which must, therefore, be referred to a supernatural agency (Fisher 1900, 9). A miracle is a divine operation that transcends what is normally perceived as natural law; it cannot be explained upon any natural basis. First, there are supernatural acts of creation. Certain creation activities were accomplished by the word of God (Hebrews 11:3); he merely spoke, and it was done (Psalm 33:9). Obviously, this type of divine action is not being duplicated today since the creation process of the material universe was concluded at the end of the initial week of earth’s history (Genesis 2:1-2). Second, there were miracles which involved a temporary and localized suspension of laws regulating nature. Jesus calmed a ferocious storm on the Sea of Galilee (Matthew 8:23-27), and, on another occasion, he walked upon the waters of the lake (John 6:16-21). Third, there were signs which involved the healing of man’s physical body. The blind were made to see (John 9:1-7), and the lame to walk (Acts 3:1-10). Fourth, there were signs demonstrating divine power over death. Lazarus, dead four days, was raised (John 11:43-44), and, of course, the resurrection of Christ is the very foundation of the Christian system (1 Corinthians 15:16-19). Fifth, some of the wonders of the New Testament age had to do with the expulsion of demons that had entered into human bodies (Matthew 12:22ff). This was evidence of the fact that the Savior’s power was superior to that of Satan. Sixth, the exhibition of divine authority was seen in the manipulation of certain material things. Christ turned water into wine (John 2:1-11), and multiplied a lad’s loaves and fishes, so that thousands were fed (John 6:1-14). Seventh, miraculous power was demonstrated in both the plant and animal kingdoms. Balaam’s donkey spoke with a man’s voice (Numbers 22:28), and the Lord Jesus, in an object lesson relative to the impending destruction of Jerusalem, destroyed a fig tree with but a word from his mouth (Matthew 21:19). In this study, we will limit ourselves mostly to a consideration of miracles recorded in the New Testament record. What are the traits of a genuine miracle, as opposed to feigned signs? Consider the following facts. A supernatural display of divine power is not an arguable proposition; it is a dramatic, demonstrable fact. No where in the New Testament is there a record of a divine spokesman arguing for the validity of miracles. No logical scheme is needed to establish such a case. Miracles either happen, or they don’t. When Jesus performed signs, even his enemies did not deny the effect of such; they merely attempted to attribute his power to some other source (e.g., Satan; cf. Matthew 12:24). The leaders of the Jewish community did not doubt that Peter and John had performed a notable miracle when they healed the lame man at the temple; rather, they sought to mute the sign’s impact by threats of violence (cf. Acts 4:14ff). Is anything being done today of such compelling nature as to elicit this type of reaction? Those performing wonders in the first century did not do so for the purpose of enhancing themselves financially—unlike the wealthy “faith-healers” of today. When Peter encountered the lame man of Acts 3, he had no money (v. 6). As a general rule, the miracles of the Bible era were done in the presence of a multitude of credible witnesses—even hostile observers. When the Lord multiplied the loaves and fishes, possibly some ten thousand or more people were present (cf. John 6:10ff). Truly, the signs validating Christianity were not “done in a corner” (Acts 26:26). Actual signs must be independent of secondary causes. By this we mean there must be no possible way to explain the miracle in a natural fashion. One is reminded of the boy whose cat gave birth to kittens. When the lad noticed the kittens were blind, he prayed for them. Sure enough, in about nine days they all could see! Hardly a miracle. Can the miracles of Christ be explained in any natural fashion? They cannot. For instance it cannot be argued that the blind man of John 9:1ff was psychosomatically afflicted, for the gentleman had been born in that condition. How can a perfectly restored ear, that had been amputated, be explained by current processes (Luke 22:50-51)? Even ancient enemies of Christianity, like Celsus and Porphyry, admitted that Jesus did certain extraordinary deeds; they suggested, of course, that it was mere “magic.” Their charges, however, are indirect testimony to the supernatural works of Christ. But who can remember a single “miracle” that Oral Roberts or Jimmy Swaggart is supposed to have performed? We submit, therefore, that so-called modern miracles do not meet the criteria suggested above. They thus must be rejected and explained upon some other basis. What was the purpose of miracles in the ministry of Christ, or in the apostolic age? As noted above, their design must be consistent with the lofty theme of redemption. And they went forth, and preached everywhere, the Lord working with them, and confirming the word by the signs that followed (Mark 16:20). The function of the signs was to confirm the revelatory process, i.e., the word of truth being communicated from God to man. spoken through the Lord, was confirmed unto us by them that heard; God also bearing witness with them, both by signs and wonders, and by manifold powers, and by gifts of the Holy Spirit, according to his own will (2:3-4). Of special interest in these passages is the term “confirm” (Grk. bebaioo). The word denotes evidence that establishes the validity of the divinely-given word (Brown 1975, 658). The supernatural gifts of the primitive age, therefore, had as their design the establishment of the credibility of Christ and his spokesmen, and so ultimately, the validation of their message, namely, that Jesus Christ is the Son of God, the Savior of the world! Now observe this very important point. If it can be established that those early miracles do corroborate the testimony of Christ, and those commissioned by him; and further, that the recording of these events in the New Testament was designed to perpetually accomplish that function, then it stands as demonstrated that the repetition of such signs is not needed today. The fact is, that is exactly what is affirmed by the apostle John. He declares that the “signs” of Christ, which he records in his gospel account, “are written [gegraptai—perfect tense, abiding effect] that ye may believe that Jesus is the Christ, the Son of God” (John 20:31). A. T. Robertson notes that this book “has had precisely this effect of continuous and successive confirmation of faith in Jesus Christ through the ages” (Robertson 1932, 317). Even those who claim that God is working miracles today, when asked if they believe that the recorded miracles of Christ in the New Testament are sufficient to establish faith in him, will answer affirmatively. It ought to be abundantly clear, therefore, that since the miracles of the Bible continue to accomplish their original purpose, there is no need for a repetition of them today. They are not being replicated in this age! Next, one should explore the method of gift reception, as that concept is set forth in the New Testament. Christ, of course, was empowered directly by God to work miracles. Such signs demonstrated that he was a “man approved of God” (Acts 2:22). So far as New Testament information goes, there were only two ways by which others received spiritual gifts in the apostolic era. The first was by means of Holy Spirit baptism, i.e., an overwhelming direct endowment of the Spirit’s power. Second, miraculous gifts were bestowed by the imposition of the apostles’ hands. Let us consider the biblical facts regarding these two matters. Holy Spirit baptism was demonstrated in only two New Testament situations. It was given to the apostles of Christ (Acts 1:5; 2:4). Then, as a very special case, it was received by the household of Cornelius (Acts 10:44-47; 11:15-17). Is Holy Spirit baptism available today? We can show that it is not by the following logical argument. First, when Paul wrote to the Ephesians (ca. A.D. 62), he affirmed that there was but “one baptism” at that time (4:5). It is generally conceded that this baptism must be either Holy Spirit baptism or water baptism. If it can be established that the one baptism of Ephesians 4:5 is water baptism, then it is obvious that Spirit baptism was no longer available. That water baptism is age-lasting is demonstrated by the fact that it is the baptism of the great commission (cf. Matthew 28:19-20; Mark 16:16). In Matthew’s account, the Lord promised that as long as his people were making disciples, baptizing, teaching, etc., he would accompany them always, even to the end of the age. Whatever the baptism of this passage is, therefore, it continues in force until the end. This baptism, however, must be water baptism, as evidenced by the fact that it is administered by human beings: “Go . . . make disciples . . . baptizing . . .” On the other hand, Holy Spirit baptism had no human administrator; it was bestowed directly by Christ (Matthew 3:11). It must be concluded, therefore, that the one baptism of Ephesians 4:5 was water baptism; consequently, Holy Spirit baptism had become obsolete. Such being the case, spiritual gifts are not received via Holy Spirit baptism today. Other than by Holy Spirit baptism, miraculous gifts could be conveyed only by an apostle of Christ. Note the evidence. Philip, the evangelist (not an apostle), could perform miracles, but he could not pass that gift along to others. Accordingly, apostles, namely Peter and John, were sent to Samaria, where Philip had been preaching, so that the church there might be furnished with certain divine gifts (cf. Acts 8:5-6; 14-17). In connection with the foregoing circumstances, Simon the sorcerer “saw that through the laying on of the apostles’ hands the Holy Spirit was given” (Acts 8:18). He wanted to purchase that privilege for himself, but he was informed that he had neither part nor lot in that matter, i.e., the impartation of spiritual gifts. At Ephesus, Paul laid his hands on twelve converts and “they spake with tongues and prophesied” (Acts 19:6). If to others I am not an apostle, yet at least I am to you; for the seal of mine apostleship are ye in the Lord (1 Corinthians 9:2). The Corinthian church (with its spiritual gifts) was, therefore a “seal” (divine documentation of Paul’s apostleship), and accordingly, indirect evidence that such gifts were received only from an apostle! Paul urged Timothy to “stir up the gift of God,” which, says he, “is in you through [dia—denoting the instrument or agency by means of which the gift was imparted (Arndt and Gingrich 1923, 179)] the laying on of my hands” (2 Timothy 1:6). Some argue that 1 Timothy 4:14 indicates that Timothy had received a spiritual gift from a certain “eldership,” which establishes a precedent for the reception of supernatural powers from a non-apostolic source. However, the passage does not suggest that. Timothy had received a gift “by prophecy, with [meta] the laying on of the hands of the presbytery.” Meta simply denotes “attendant circumstances” and does not suggest that the gift came by the hands of the elders (Green 1907, 207). This verse asserts that Timothy had received a spiritual gift on the same general occasion when elders had laid hands upon the evangelist—doubtless to appoint him to some special mission. It does not affirm that the elders themselves imparted miracle-working ability to Timothy. Since, therefore, there is no Holy Spirit baptism today; and further, since there are no apostles (or successors to them) in this age, it should be quite clear that men are not in possession of supernatural gifts of the Spirit in this post-apostolic era of the Christian dispensation. Were miraculous gifts to abide with the church until the end of time, or, due to their specific design, were they only a temporary phenomena? This matter is discussed rather comprehensively in two New Testament contexts. We will consider each of these. In 1 Corinthians 13, the inspired apostle addresses the duration of spiritual gifts in the Lord’s church. He commences by showing that these gifts must be exercised in love, for miraculous powers, void of love, were worthless. This theme was quite appropriate in view of the disposition of rivalry which threatened the unity of the Corinthian congregation (some exalting certain gifts above others, etc.). From this initial instruction there is a very natural transition into the character and permanence of love, in contrast to the transitory function of spiritual gifts. Of the nine gifts mentioned in 12:8-10, Paul selects three to illustrate his argument. Significantly, all three were related directly to the revealing of God’s will to man. The apostle affirms that prophecies shall be done away, tongues shall cease, knowledge (i.e., supernatural knowledge) shall be done away. It is wonderfully clear, therefore, that these three gifts (and by implication all miraculous gifts) were not designed to be a permanent fixture within the church. In 1 Corinthians 13:9, Paul contends that God’s will, by means of these spiritual gifts (knowledge, prophecy, etc.) was made known gradually, i.e., “in part.” The expression “in part” translates the Greek to ek merous, literally, “the things in part.” It denotes “a part as opposed to the whole” (Abbott-Smith 1923, 284). And so, we make the following argument: The “in-part” things shall be done away. But, the in-part things are the supernatural gifts by which the will of God was revealed. Thus, the supernatural gifts, by which the will of God was made known, were to be terminated. So, we may reason as follows: Whatever the in-part things are partially, the whole is, in completed form. But, the in-ppart things were the spiritual gifts employed in the revealing of God’s will (word). Therefore, the whole was God’s will (word)—as conveyed through the gifts—completely revealed. God’s revelation is being made known part-by-part, through the use of spiritual gifts; when that revelation is completed, these gifts will be needed no longer, hence, will pass away from the church’s possession. With the completion of Apostolic testimony and the completion of the Scriptures of truth (“the faith once for all delivered to the saints”, Jude 3. R.V. ), “that which is perfect” had come, and the temporary gifts were done away (1951, 184). Remember this vital point: spiritual gifts and the revelatory process were to be co-extensive. If men are performing miracles today, their messages are as binding as the New Testament record! If such is the case, the New Testament is not the final word. The original word denotes “complete qualification for a specific purpose” (The Analytical Greek Lexicon n.d., 220). Or, as Arndt and Gingrich render it, “to equip the saints for service” (1967, 419). Moreover, the duration of these supernatural governments was specified. They were to continue “till we all attain unto the unity of the faith” (4:13). “Till” is from mechri, and it suggests a “specification of time up to which this spiritual constitution was designed to last” (Ellicott 1978, 95). The word “unity” (henotes) basically means “oneness” (_The Analytical Greek Lexicon n.d., 119). It derives from the term hen, the neuter of heis, and it emphasizes oneness “in contrast to the parts, of which a whole is made up” (Arndt and Gingrich 1967, 230). Finally, the expression “the faith” refers to the revealed gospel system (cf. Galatians 1:23; 1 Timothy 5:8). And so, to sum up: the apostle contends that spiritual gifts would continue until the gospel system, in its individual parts (as portrayed in 1 Corinthians 13), came together in oneness, i.e., the completed or whole revelation (New Testament record) (see MacKnight 1954, 335). Ephesians 4 and 1 Corinthians 13 are wonderfully complimentary. We will now consider a couple of arguments that frequently are employed in an attempt to prove that miracles did not cease with the apostolic age. First, some contend Paul taught that spiritual gifts would continue to the very end, i.e., unto the coming of Christ. First Corinthians 1:6-8 is cited to establish this. We offer the following points. It is not certain that miraculous gifts are even in view within this context. Meyer argues that spiritual blessings in general are under consideration, not miraculous gifts (1879, 19). Even if miraculous gifts are in view, the text no more asserts that they will be operative until the Lord’s return, than it does that the Corinthians themselves would remain alive until that event. The word “end” can mean “to the uttermost” (cf. John 13:1), and thus the reference may not be to the end of time. One may be confirmed (sustained) through the message of the inspired Word (2 Timothy 3:16,17), hence, be unreprovable in the day of Christ, without needing to possess supernatural gifts. Second, it is claimed that the Lord is as powerful today as he was in the first century; and so, he can perform signs today. But the question is not one of God’s power; it is a matter of his will. Does he will to perform miracles today? He does not will to create men directly from the dust of the earth. He does not will to feed us with manna from heaven, etc., though he is powerful enough to do such feats. The “he-has-the-power” quibble proves nothing. The scholarly T.H. Horne presented a remarkable summary statement of this matter that is worthy of consideration. Why are not miracles now wrought?—we remark that, the design of miracles being to confirm and authorize the Christian religion, there is no longer any occasion for them, now that it is established in the world, and is daily extending its triumphs in the heathen lands by the divine blessing of the preached gospel. Besides, if they were continued, they would be of no use, because their force and influence would be lost by the frequency of them; for, miracles being a sensible suspension or controlment of—or deviation from—the established course or laws of nature, if they were repeated on every occasion, all distinctions of natural and supernatural would vanish, and we should be at a loss to say, which were the ordinary and which the extraordinary works of Providence. Moreover, it is probable that, if they were continued, they would be of no use, because those persons who refuse to be convinced by the miracles recorded in the New Testament, would not be convinced by any new ones: for it is not from want of evidence, but from want of sincerity, and out of passion and prejudice, that any man rejects the miracles related in the Scriptures; and the same want of sincerity, the same passions and prejudices, would make him resist any proof, any miracle whatever. Lastly, a perpetual power of working of miracles would in all ages give occasion to continual impostures, while it would rescind and reverse all the settled laws and constitutions of Providence. Frequent miracles would be taught to proceed more from some defect in nature than from the particular interposition of the Deity; and men would become atheists by means of them, rather than Christians (1841, 117). How does one deal with the alleged “miracles” of this modern age? In the first place, we really are not obligated to defend as divine a modern event simply because it may have certain elements that are difficult to explain. There are many illusions that modern magicians perform which the average person cannot explain; but they do have natural explanations. They are not miracles. That aside, there are several possible bases for so-called modern miracles. As an example, let us focus upon alleged faith healings. Some instances of faith healings are pure fakery. Consider the case of Peter Popoff, miracle-working cleric of Upland, California. Popoff, who claimed the supernatural ability to provide secret information about people in his audiences (in conjunction with “healing” them), was receiving such data through a tiny hearing aid, the messages being transmitted by his wife from backstage. Prominent magician James Randi exposed the entire affair on nationwide television (1987, 139-181). Randi also demonstrated that Popoff was providing rented wheelchairs for people who could actually walk; then, at his services, he was pronouncing them healed. Some “miracle cures” are claimed by people who honestly believe that God has healed them. The fact is, however, they had nothing organically wrong with them. Their ailment was psychosomatic. This means that though some bodily feature was actually affected, the real root of the problem was mental or emotional; hence, by suggestion a cure might be effected. It is generally believed by experienced physicians that at least two-thirds of the ordinary cases of sickness which doctors are called upon to treat would, if left entirely alone, recover without the aid of the doctor or his medicine (1929, 15). Taking advantage of this type of sickness, the faith-healer, in an atmosphere of hysteria and feverish emotionalism, produces some phenomenal “cures.” But there is nothing miraculous about such cases. A physician in Toronto, Canada investigated thirty cases in which Oral Roberts claimed miraculous healing was effected; he “found not one case that could not be attributed to psychological shock or hysteria” (Randi 1987, 288). Dr. Sadler affirmed that after twenty-five years of sympathetic research into faith-healing, he had not observed a solitary case of an organic disease being healed. It is commonly known that an African witch-doctor can literally command a believer in voodoo to die, and within the prescribed time, the victim will expire. This evidences the powerful control of the mind over the body. Surely no one will claim, though, that a witch-doctor has the Spirit of God. Another explanation for some so-called faith cures is a phenomenon known as spontaneous remission. Spontaneous remission is an unexpected withdrawal of disease symptoms, and an inexplicable disappearance of the ailment. It occurs in about one out of every eighty thousand cancer patients. Joseph Mayerle of Bremerton, Washington had exploratory surgery; it was discovered that he was consumed with cancer. His physicians gave him only a few months to live. Months sped by and his disease utterly vanished. There was nothing miraculous about it. According to newspaper accounts, Mr. Mayerle, a bartender, made no claim to faith, prayer, or a miracle-cure. Wouldn’t a faith-healer have delighted in taking credit for that case? There is one final point of this presentation that needs to be pressed with great vigor. There is no alleged miracle being performed today by Pentecostals, or those of a similar “Christian” persuasion, that cannot be duplicated by various cults and non-Christian sects. Those who practice Christian Science, Mormonism, Catholicism, Transcendental Meditation, Yoga, Psychic Healing, Scientology, New Age Crystal Healing, etc., claim the same type of signs as the Pentecostals. In fact, more than 20 million Americans annually report mystic experiences (including healing) in their lives (Psychology Today 1987, 64). Since the Scriptures clearly teach that the purpose of miracles, as evidenced in biblical days, was to confirm the message proclaimed, hence, to validate the Christian system, do the multiple alleged examples of miracle-workings indicate that the Lord has authenticated all of these woefully contradictory systems? Think of the implications of that—especially in light of Paul’s affirmation that God is not the author of confusion (1 Corinthians 14:33). There is abundant evidence that genuine miracles were performed by divinely appointed persons in the first century, but there is no proof whatever that such wonders are being replicated in this modern age. Abbott-Smith, G. 1923. A Manual Greek Lexicon of the New Testament. Edinburgh, Scotland: T.&T. Clark. Arndt, William and Gingrich, F.W. 1967. A Greek-English Lexicon of the New Testament. Chicago, IL: University of Chicago. Brown, Colin, ed. 1975. Dictionary of New Testament Theology. Vol. 1. Grand Rapids, MI: Zondervan. Ellicott, C. J. 1978. Critical and Grammatical Commentary on Ephesians. Minneapolis, MN: James Family Publishing. Fisher, George P. 1900. Manual of Christian Evidences. New York, NY: Charles Scribner’s Sons. Horne, Thomas H. 1841. A Critical Introduction to the Holy Scriptures. Vol. 1. Philadelphia, PA: Whetham & Son. Kittel, Gerhard, ed. 1972. Theological Dictionary of the New Testament. Vol. 8. Grand Rapids, MI: Eerdmans. MacKnight, James. 1954. Apostolical Epistles. Nashville, TN: Gospel Advocate. Meyer, H. A. W. 1879. Corinthians. Vol. 1. Edinburgh, Scotland: T. & T. Clark. Randi, James. 1987. The Faith-Healers. Buffalo, NY: Prometheus. Robertson, A. T. 1932. Word Pictures in the New Testament. Vol. 5. Nashville, TN: Broadman. Sadler, William S. 1929. The Truth About Mind Cure. London, England: George Allen & Unwin. The Analytical Greek Lexicon. n.d. New York, NT: Harper & Bros.
Vine, W. E. 1951. 1st Corinthians – Local Church Problems. Grand Rapids, MI: Zondervan.